We are the No1 Message On Hold company delivering thousands of Telecom Announcements across the globe. Work flexibly from home, get paid immediately, up-sell extra services. Our Script Wizards ensure first time perfect scripts, minimal customer review and efficient job handling. Develop long term repeat customers from our massive dealer and customer base. You must have your own Voice Recording facilities, you will not be required to mix music and voice announcements, just provide us with good quality voice recordings. Fill out the Voice Actor signup form. Pay particular attention to the Voice Actor Contract. We will review your application & approve you. You will then get your Username and Password which will allow you access to the site. You can then upload your full profile and samples of your Voice Actor skills and begin receiving work! You must only upload clean noise-free samples without background music. You must read our Guide for Voice Actors thoroughly. You will receive a flat rate per word (£0.05/$0.08/€0.06) for standard Announcements up to 200 words. Our customers are encouraged to buy your special skills such as Script Assistance, Impressions, Character Acting etc. You can fix your own rate for these special skills. We will pay you within 14 days of any Announcement being approved by our customers. You can be paid direct into your bank account or via PayPal. It is vital that you read and understand the Voice Over Contract. If you are stating that you are available to make recordings, you must meet your promise to our customers. The web site will automatically avoid using less reliable Voice Actors. You must opt in for text messages to your mobile to inform you when you have work. When you get your Username and Password you will have access to a web portal that will list and manage your work. Would you like to be emailed with site updates? 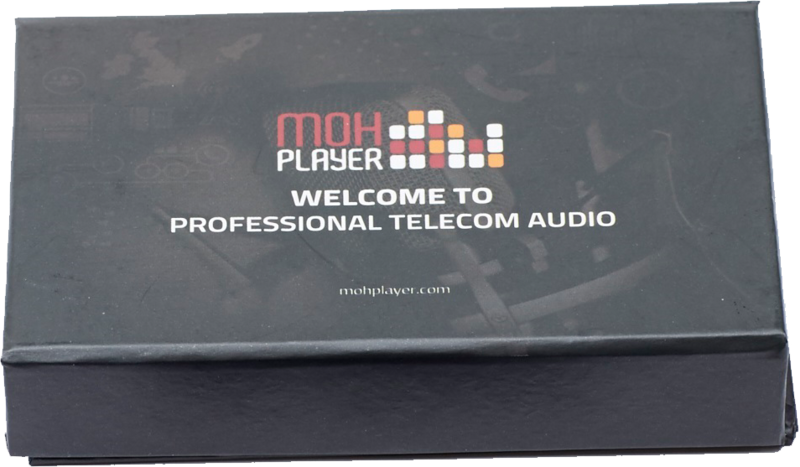 The customer (Customer) who is a client of MOH and has registered with MOHPlayer.com to purchase the services of Talent on an individual project basis. ‘Availability’ shall mean Talent’s stated availability entered by Talent from time to time onto MOHPlayer.com or MOHActor.com indicating Talent’s timetable of availability to accept work from Customers. ‘Project’ is an individual engagement of Talent by a Customer to produce a voice over recording according to the terms of this Agreement. ‘Customer Script’ shall mean a written composition by the Customer sent to Talent for consideration for voice over recording by the Talent. ‘Copywriting’ shall mean an original composition of words or the re-writing of the Customer Script in written format in accordance with the ideas and instruction of the Customer to produce a final script. ‘Special Skills’ shall mean Talents unique and unusual or special skills it may offer Customers. Such Special Skills may include languages, dialects, impersonations and unique characters and are generally charged as a separate cost to MOH and the Customer. ‘Final Script’ shall mean the final version of any Customer Script and any additional Copywriting as agreed and approved by the Customer. ‘Voice Over Recording’ shall mean the audio recording of the Talent’s voice according to an agreed Final Script. ‘Customer One Time Review’ shall mean a review of the first produced Voice Over Recording by the Customer for compliance against the Final Script. ‘Remedial Work’ shall mean modifications by Talent to the Voice Over Recording based on the Customer One Time Review to produce a recording for final approval. ‘Final Recording Approval’ shall mean the acceptance of the voice recording by the Customer concluding Talent’s obligations for the Project. MOH is a supplier of Message On Hold services to Customers. To facilitate its business, MOH operates as introducer and reseller of Talents services to the Customer. Talent offers Copyrighting and Voice Over Recording services to MOH and its customers on a non-exclusive basis. Talent accepts that by entering into this Agreement it shall make its best efforts to meet its obligations to MOH and MOH’s Customers. 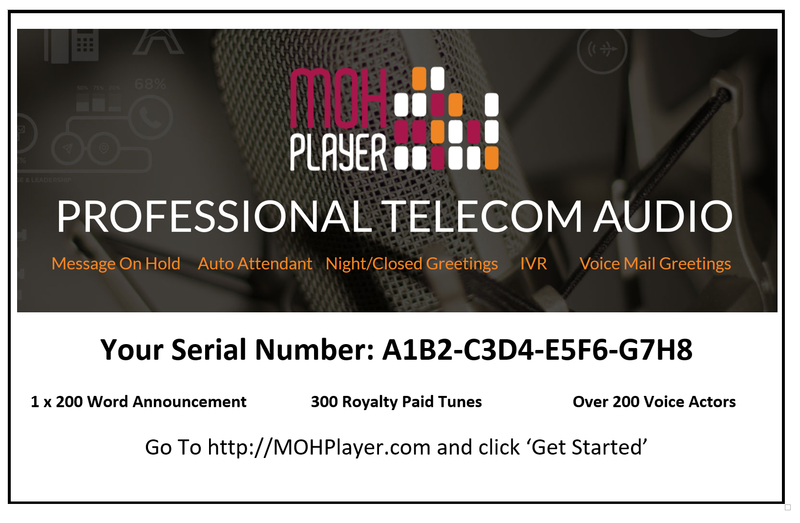 By entering Talent’s Availability on MOHPlayer.com and MOH Actor.com, Talent accepts that Talent is ready and willing to take on Projects from Customers in a professional and timely manner and that time is of essence. Talent cannot refuse to take on a Project once Talent has indicated Availability acceptable to the Customer and the Customer has decided to hire the Talent for the Project. MOH reserves the right to withhold payments for previous Projects and to cancel Talent’s current Projects should Talent prove unreliable, non-professional or non-responsive to Customer requests once projects have been accepted. Further, MOH reserves the right to cancel this Agreement and suspend all Projects and remove Talent from MOHPlayer.com and MOHActor.com due to reasons of unreliability. Click the checkbox to acknowledge that you have read your agreement with Message On Hold and agree to its terms.